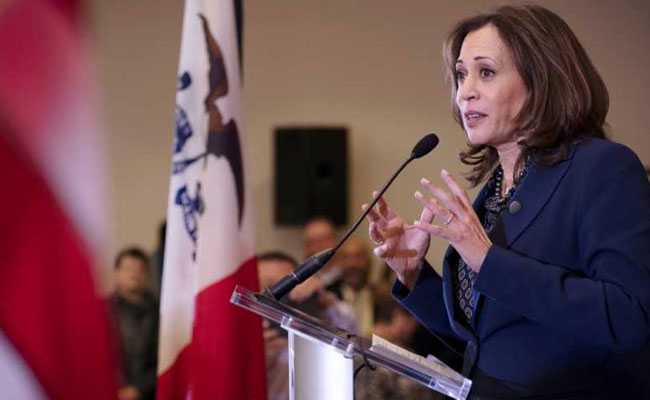 Kamala Harris, often referred to as "Female Barack Obama", by her admirers announced on Monday that she plans to run for the President of the United States of America in 2020 against Donald Trump. Already in the race are four more women - Senator Elizabeth Warren of Massachusetts, Hawaii Congresswoman Tulsi Gabbard, New York Senator Kirsten Gillibrand and former housing secretary Julian Castro, among others. Presently Kamala Harris is on several key panels including the Homeland Security and Governmental Affairs Committee, the Select Committee on Intelligence, the Committee on the Judiciary, and the Committee on the Budget. A renowned prosecutor, Kamala Harris made the announcement on the national holiday honouring civil rights movement icon Martin Luther King Jr., whom she said her mother met. The Senator from California, whose campaign slogan is "Kamala Harris: For the People", is seeking to become the first Indian American woman to take on Donald Trump. Born in 1964 to immigrant parents, Kamala Harris' mother was Shyamala Gopalan Harris and father Donald Harris, who met during the turbulent years of the Civil Rights Movement. An Indian, Shyamala Gopalan Harris, came to the United States, when she was only 19, to pursue her studies and went on to become a well-known breast cancer specialist. Her father, from Jamaica, is an economics professor at Stanford University. Kamala Harris, after announcing her plans to enter the race for the White House, posted a childhood picture with her mother saying "Thinking of my mother today. She was smart, fierce, and my first campaign staffer - and I dearly wish she was here with us for this moment. Her spirit still drives me to fight for our values." Criminal justice system, civil rights, environment, higher education and foreign policy are issues close to her heart. Her parents were divorced when she was just 7-years-old. Her mother had the custody of her and her sister Maya Harris, who went on to become a lawyer and adviser to Hillary Clinton. Ms Harris studied political science and economics at Howard University. An avid debater, she completed her law degree from UC Hastings College of the Law in San Francisco. She was admitted to the California State Bar in 1990. With many firsts to her credit, Ms Harris is the first woman and first black person to serve as chief law enforcement officer of California for two terms (2011-2017). Earlier she was also elected the district attorney of San Francisco. In her memoir - "The Truths We Hold: An American Journey," Ms Harris spoke about what her candidacy might mean in an America "divided by Trump's unsettling presidency." "The future of our country depends on you and millions of others lifting our voices to fight for our American values. That's why I'm running for president of the United States," the Democrat California Senator said, in a video posted on Twitter. In her book, Ms Harris recalls that as a prosecutor, she fought big banks during the 2008 downturn and saw herself as a champion of middle class families "living paycheck to paycheck", who is against police brutality and the killing of unarmed black men.